The new rules issued last month by the U.S. Environmental Protection Agency limiting the amount of carbon that new coal- and gas-fired plants can emit will have little effect on current operations at CPS Energy. Additional regulations, which would affect existing power plants, are expected sometime in 2014, and these may have a greater impact on CPS Energy. Accordingly, we are actively monitoring and offering input, where appropriate, as these new rules are formulated. Thanks to prescient decisions CPS Energy has made over the last decade, we are well-positioned to weather this increase in federal regulation and their accompanying higher costs. CPS Energy is committed to providing electrical power and gas services to our customers in an environmentally responsible manner, and has long invested in the environmental practices necessary for the well-being of our community, our business and our employees. That has meant a policy of generation diversification that has emphasized reducing the emission intensity of our fleet by adding natural gas, wind and solar power, using ultra low sulfur coal and adding pollution control measures to existing coal plants. Since CEO Doyle Beneby’s arrival in 2010, he has emphasized the economic value of reducing the carbon intensity of the fleet, as he warned of the additional federal regulations now coming to pass. CPS Energy has spent $253 million on pollution controls since 1997, which have lowered nitrogen oxides (NOx) emissions by 70 percent. Particulate matter has been reduced from nearly 1,500 tons to less than 250 tons due to the replacement of electrostatic precipitators with more efficient baghouse systems. When comparing all 42 coal units in Texas, JT Deely 1 and 2 rank number four and number eight for lowest tons of NOx emitted in 2012, the latest data available. Spruce 1 ranked among the top six best reporting units in Texas for sulfur dioxide (SO2) emissions on a pounds per million Btu basis, while Spruce 2, which was completed in 2009 with the most technologically advanced environmental controls available, ranked number one. 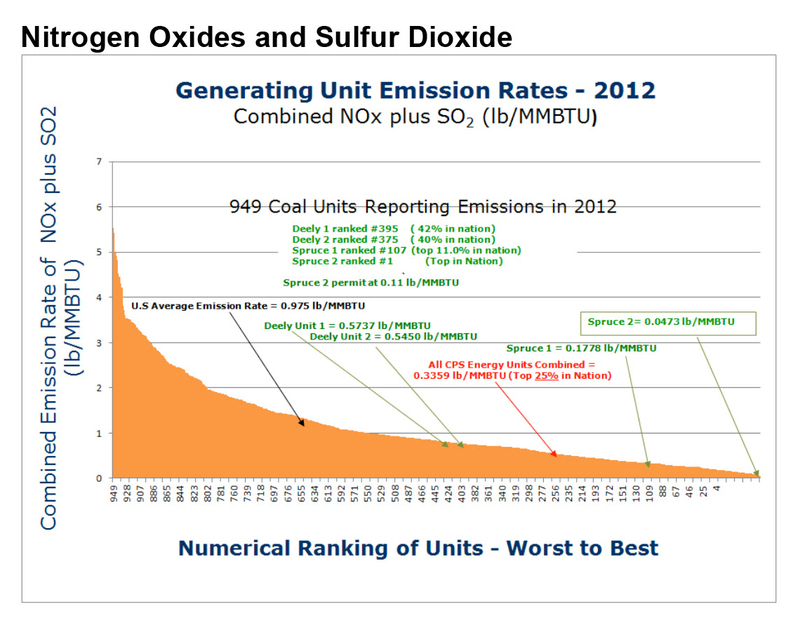 CPS Energy’s coal plants also rank among the cleanest in the nation for combined NOx and SO2 emission rates. Combined, they rank in the top 25 percent; Spruce 2 ranks number one in the nation with the lowest combined NOx and SO2 rates of all 949 plants. With a combination of gas, coal, wind, solar and nuclear energy sources, CPS Energy’s total generation nearly quadrupled from 1980 to 2012, to meet the needs of one of the largest and fastest growing cities in the nation. Meanwhile, carbon dioxide emissions have decreased by roughly 700 pounds per net megawatt hour of generation from all sources of power. 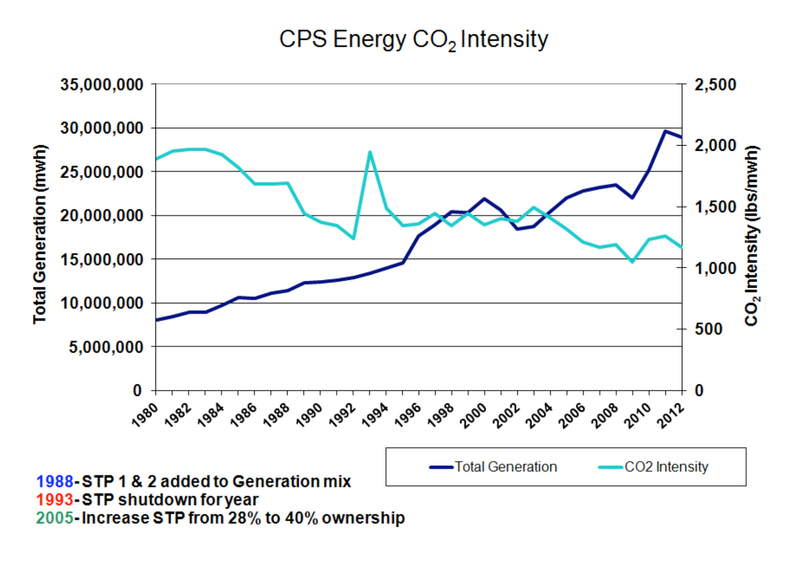 As the EPA continues to tighten existing rules for power plant emissions, and create new rules for CO2 emissions, CPS Energy and its customers will reap the benefits of past decisions and our current strategy. The rule announced in September would apply to new power plants. CPS Energy is currently in the midst of a multi-year campaign to reduce energy demand by 771 megawatts, to delay having to build the next power plant to meet growing demand. Eventually, CPS Energy will likely build a new plant, probably natural gas. The new rules would likely make permitting and building the plant more complicated and costly. Rules expected next year would apply to existing plants, which is why CPS Energy is monitoring them so closely, both through our environmental department and governmental affairs. For example, we would like to see credit given to utilities like CPS Energy, which have already gone to certain lengths to reduce emissions. CPS Energy will continue to provide reliable, affordable and environmentally responsible power to our community. We can all do our part by reducing energy demand. glad to have a blogger in our family. interesting info! !